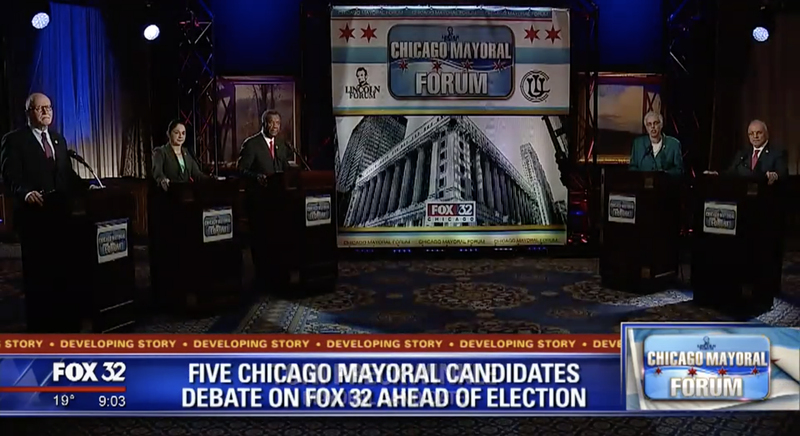 WFLD is having a busy week — hosting two Chicago mayoral forums in a crowded race. On Thursday, Feb. 7, 2019, the station produced a forum from the Union League Club in downtown Chicago at 6 p.m. local time. This forum, which had a last-minute drop out of Bill Daley, had three lecterns on one side of a large branded printed graphic and two on the other. Trusswork with accent lighting was also used. 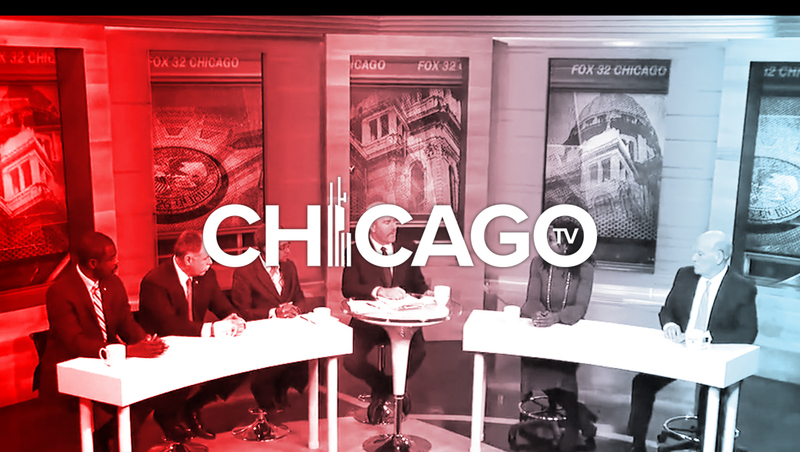 The station offered extensive coverage of the event within its newscasts, including a large ‘Chicago Mayoral Forum’ logo that was shown on its set video walls along with the ‘Fireworks Erupt’ headline above the anchors. 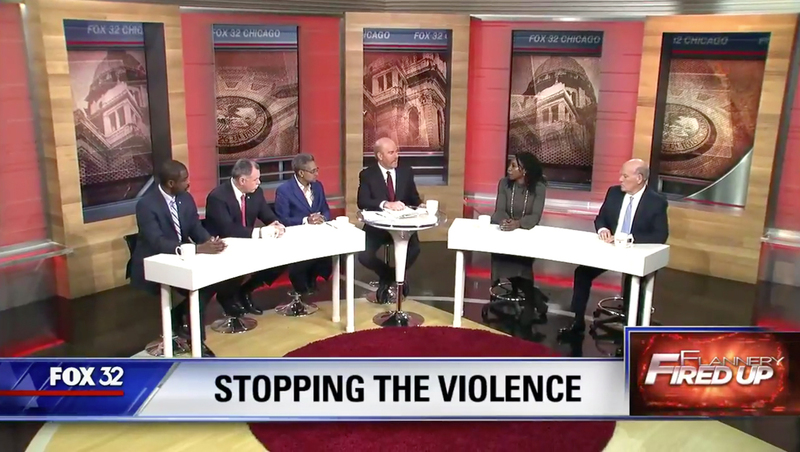 WFLD also hosted a Facebook Live forum, again with five candidates, hosted by Mike Flannery. The setup here features two curved white tables set up in the station’s interview and multipurpose set with a round red rug added. Flannery sat in the middle using the small bar-table style table normally used at ‘The Live Desk’ area of the set. The vertical video panels in the walls behind them featured muted Chicago-themed imagery. 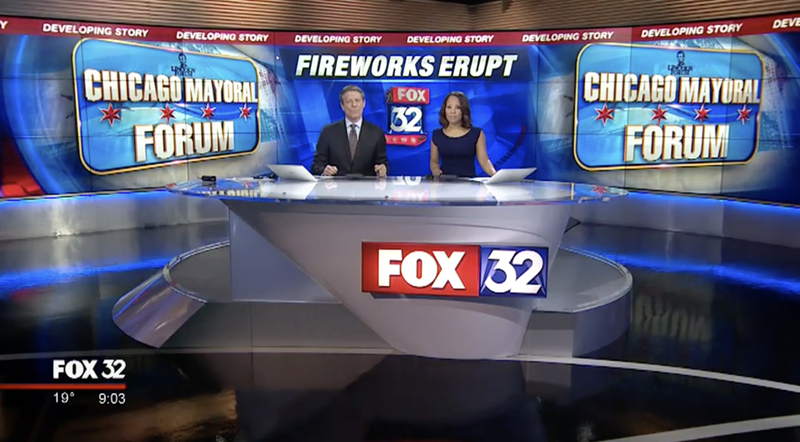 The forum ran again on Friday evening on WFLD and was promoted using an fire themed promo.